Fresh floral crowns have been a popular accessory all over the world for centuries. They were used for weddings, harvest celebrations and to honor deities and champions. There’s no need to wait for a special occasion to create one of these beauties. Grab a bouquet of flowers — we’re making a crown fit for a queen. 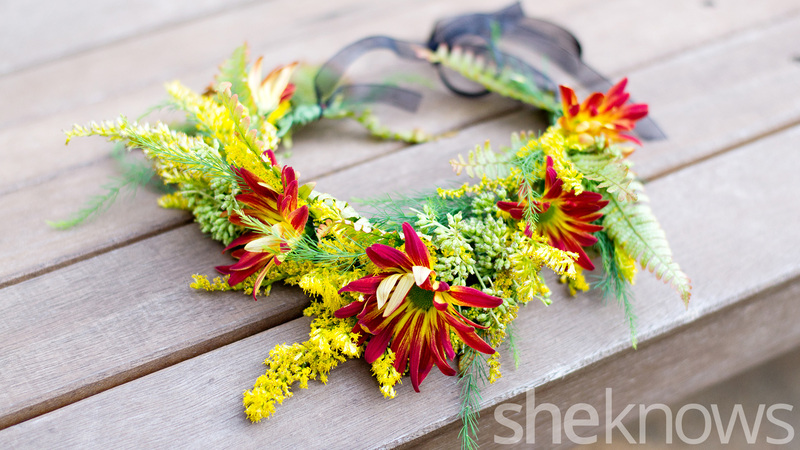 Floral crowns are a great project to make for a wedding or baby shower or even a birthday. If you can’t imagine donning one on your own head, consider using a floral crown as a natural centerpiece for your next family gathering. These crowns are simple to make and require very few supplies. You can purchase a bouquet of flowers from the store. Choose hardy flowers like mums and roses. They will last a day or two without water. 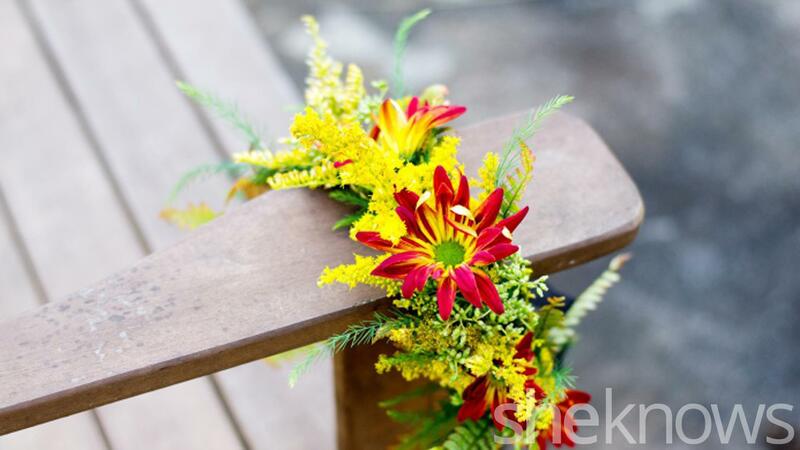 Make sure the bouquet has plenty of greenery and filler flowers too. Ferns and baby’s breath hold up well out of water as well. I used mums, goldenrod, ferns, asparagus ferns and dried hydrangea flowers. I clipped all of my flowers and greenery from my own yard. Another option is to use colorful fallen leaves. The method to wire them will be the same. Leaves will make a festive, seasonal crown and the materials are mostly free. 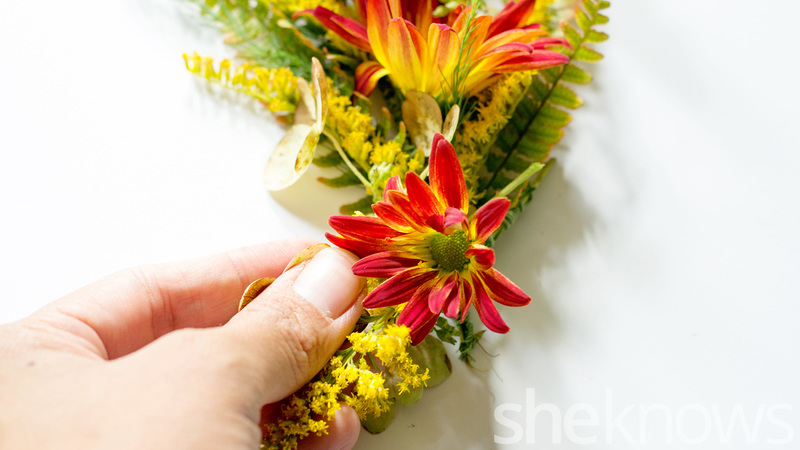 Cut apart your flowers and greenery into single stems. 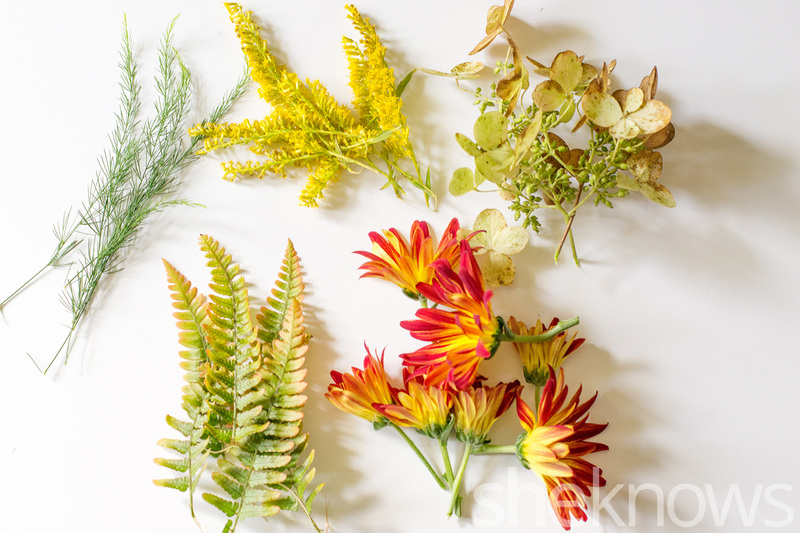 Remove the leaves of the flowers and the last 2 to 4 leaves on the greenery. This will give you exposed stems so you can wrap the wire around. Select a piece of greenery. I started with a segment of fern. 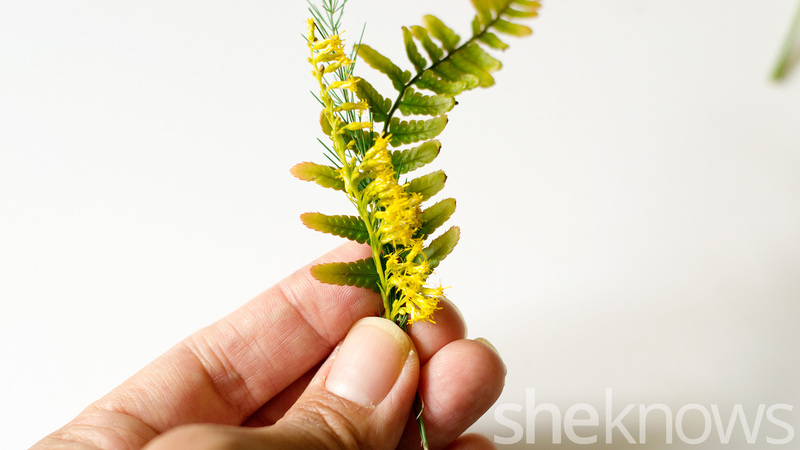 Lay a segment of filler flower or greenery on top (I used asparagus fern) and then a small flower (goldenrod). 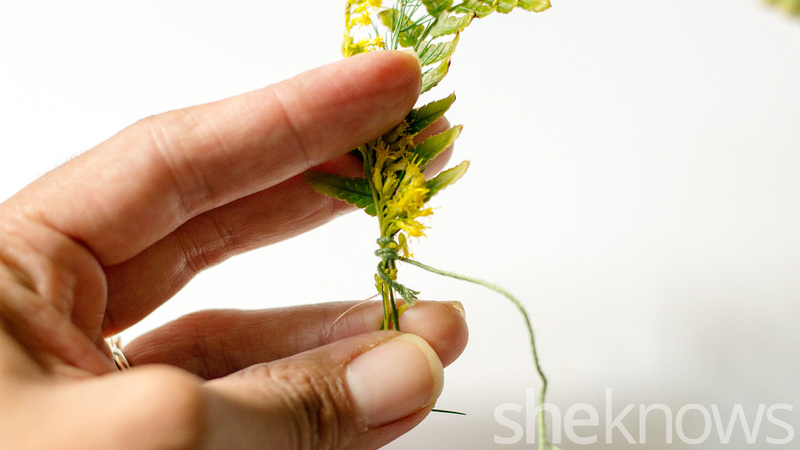 Cut a length of floral wire (about 3 inches). Wrap around the base of the greenery/floral segment. Continue to wrap the floral wire around the floral segments a couple of more times until all the pieces are secure. Leave about a 1-1/2-inch segment of wire. Take a flower segment and lay it on top of the previously wired segment. 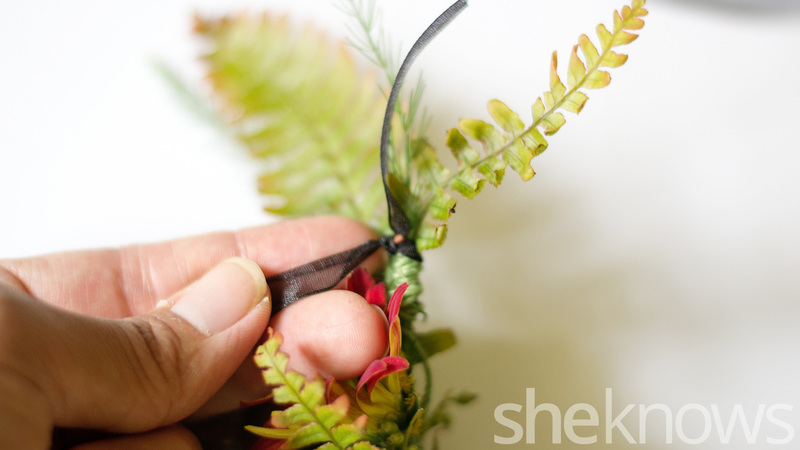 Use the 1-1/2-inch piece of floral wire still attached to the greenery segment to wrap around the newly added flower. Wrap the floral wire around both segments until secure. 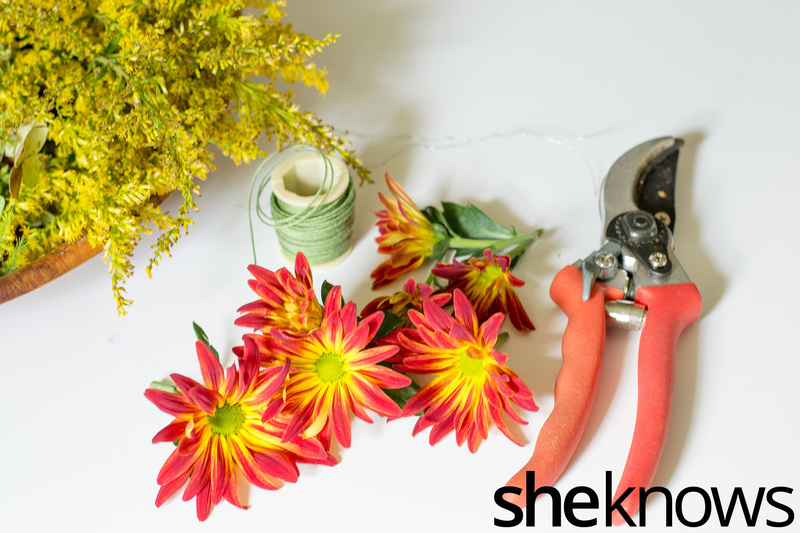 If the flower feels loose, cut another length of wire and wrap around both segments again. Continue adding greenery and flowers to the previous segment by wiring the new segments on top of the stem of the previous segment. 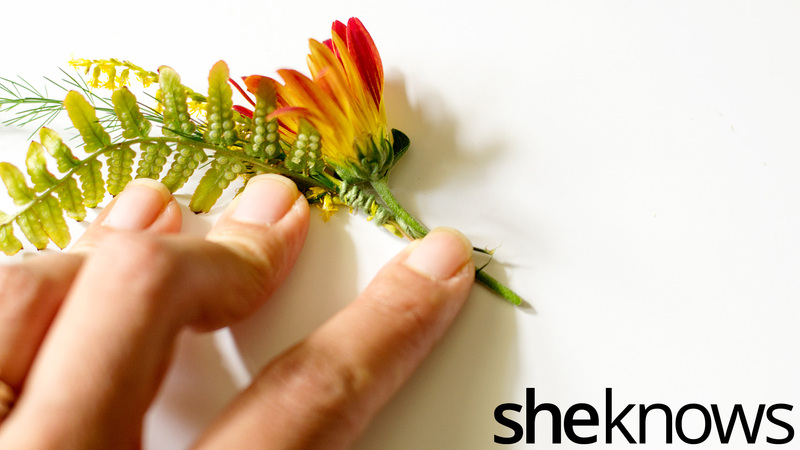 Alternate the greenery and flowers until your crown reaches 8 inches in length. After you attach the last floral/greenery segment, cut two 6-inch lengths of ribbon. Tie each length of ribbon to each end of the crown. Tie the other ends together in a bow and voilà! Now, place your beautiful crown on your head and dance around a meadow of wildflowers. Oh, you are not into meadow dancing? That’s OK! Go ahead and place your beautiful floral crown around a vase or a large candle. There you have it, a lovely seasonal centerpiece for your table.